Transparent Half Dome Mirror, Size: 18"
Full Dome Acrylic Mirrors/Stainless steal Acrylic Full Dome Mirrors, Foam backing for extra strength. Perfect for Hallways at "T" intersections & for monitoring lobbies & waiting room with obsucted views. Hook & chin are included. Lowest price on the internet - very coast effective. - to prevent accidents at blind corners, intersections, entrances and exits. - also available in half dome and quarter dome. - Convex mirror, fish eye mirror in which the reflective surface bulges toward the light source and it's reflecting light outwards. These are the Traffic Mirrors . These mirrors are of high quality and are available at a very reasonable price. Convex Mirror 26", Size: 26" And 30"
Owing to the wide experience of this domain, we are instrumental in offering Quarter Dome Mirror. 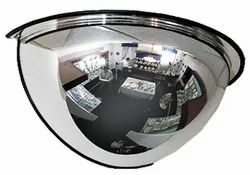 Transparent Half Dome Mirror, Size: 26"
Size: 12" , 18", 24", 32", 36"
3.Dimension : 24 Inches (60 cms).